Craftsman, artisan, skilled workman are called Shokunin in Japanese. Shokunin is a worker who has very highly‐developed and skilled techniques. 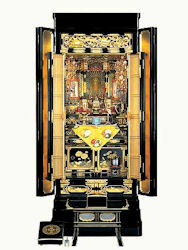 Originally, high techniques were required, because they presented it to Imperial House or feudal lords, and to sacred place such as Shinto shrine or Buddhism temples. Therefore Shokunin were respected among any classes. Present Japan have no class system, but Shokunin are highly respected still now. Shokunin never compromise, even if 1mm and 1g. They pay attentions to details (as we may not be able to realize it). They do it as putting their life on a given work. They practice very very hard to get high techniques. They are regarded as full-fledged craftsman after over almost ten years practice. This craftsmanship temperaments not only appear on Shokunin but also on other jobs. For example, sumo referee is so. They have a short sword on their waist. With the purpose that they do harakiri with it, if they misjudged. Of course, actually they do never so, even if misjudge at present. But it’s symbol of working hard seriously. And also Japanese train system is famous on being punctual. In Japan, “ten minutes delay” is treated as “accident”. They don’t compromise even if one minute. What’s the source of this diligence? Maybe it’s Buddhism, especially the word “Ichigu wo Terasu” of Tendai Buddhism, or “Issho Kenmei” of Zen. “Ichigu wo Terasu” means “Shine a corner”. I mean, “You should do your best at your ability range”. “Issho Kenmei” means “Do your best at one place = Discharge your duties”. Both words are the same meaning. Especially, the latter word was accepted among many Samurai class. And it became also the base of Bushi-do. And also we have a word “Sanpo Yoshi (Good for three directions)”. It means “take precautions against selfish”. And it means “If you and I are satisfied, society is gonna be good”. On business, “Think other benefit before thinking own one”. In common society, “Don’t give somebody trouble”, we understand. These ideas lead to highly professional ethics such as “Don’t leave a job half done” and “Pay attention to details thoroughly”. These cultural background is backing up highly professional ethics and high quality Japanese items. Indeed, I can’t help but say that the items made in Japan are expensive. However I believe you must be convinced of that, if you knew Japanese craftsmen make it without compromise, and with their stupendous and the great high techniques. If you could see their workshop, probably you would think it’s cheap soon. 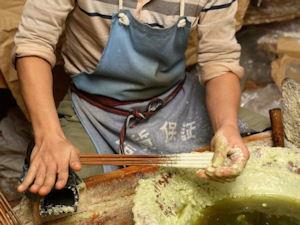 Craftsmen of traditional craft make item in order to last 100 years. So I think craftsmen’s item is cheap, even if the price of tags is expensive (compared with repeatedly buying item which is cheap and easily breaks). And craftsmen’s item will give good after‐sales service. I wish you avoid “A cheap purchase is money lost”, and enjoy these wonderful techniques & items! The main material of Japanese candles is Japan wax tree. This trees are growing wild naturally in East Asia only. Moreover, only the trees that grew in Japan become a candles. Craftsman left an ingredient analysis to scientist. As a result, they’ve gotten a one answer. 6% one ingredient was included in the tree that grew in Japan. It’s called “Japan acid”. If Japan-wax tree have not Japan acid, craftsman couldn’t make candles. Because sootless candles don’t give damages to other Buddhism items and temples’ tools (Japanese Candles will give you long use of Buddhism items from 5 to 10 years at least). Nowadays, Japanese candle studios are only 20. At half of 20 studios, there are no successors. But, Technique of Japanese candles won’t go out for the time being. We’ve got more serious situation. The farmers of Japan wax tree are decreasing incredibly from this side. I mean, Japanese candles will go out in the near future from this side. So, I want to get you to have more chance to use Japanese candles. Output of Japanese style candle are decreasing now. Not be in demand, Japanese candles were pushed out by mass production (paraffin candle) from the market. Because the process of candles are a time‐consuming job, and it might be a little high price. The main material of Japanese candles is Japan wax tree. That’s one of vegetable wax candle. This trees are growing wild naturally in East Asia only. Moreover, only the trees that grew in Japan become a candles (say later). One; The farmer of Japan Wax tree harvest a nut, crush it, and extract wax from it. They send them to candle craftsman. Two; Craftsman winds around paper and an igusa plant (one of rush) to thin wood stick (= wick). He soak wax into the wick. Three; He rolls sticks on his hand that have wax. If inexperienced person, it would get burned. (See also the pics). He repeats to dry and add wax. For that reason, Japanese candles have some rings like an annual rings of a tree. Candles are an essential tools for Christian and Buddhism religious services. These days, generally, also we are using western style candles which have string wick in Japan. Western style candle have possibility to be introduced to Japan by missionary in the Middle Ages (Christianity, Catholicism, was introduced to Japan at that period). However, Western style had gained popularity since Meiji period (from 1868). Japanese people had used Japanese style candles till that period. Candle were introduced to Japan from China along with Buddhism. At that time, at Europe and Asia, candles were beeswax which are made of honey. In Heian period (8th – 12th century), pine‐tree gum took the place of honey, in Muromachi period (14th – 16th century), vegetable wax (Japan wax tree) took the place of them. Meanwhile, in western (Europe), animal wax took the place of honey, for example whales and pigs. However, Japanese Buddhism had never used western style candles, because Buddhism prohibited taking of life (Japanese people had never ate meat except fish till Meiji period basically). And it needed not importation. Since Edo period (17th ? 19th century), Japan wax tree were introduced to the domain of Shimazu (in what is now Kagoshima pref.) from Ryukyu Kingdom (in what is now Okinawa, Japan). And output was increased. On the other hand, in western, paraffin wax candles were developed, output was increased incredibly. This paraffin wax candles have been used since Meiji period. In Muromachi period (14th -16th century), Shoin-Zukuri (Zen cultural house) had taken a firm hold to Samurai culture. And they put Buddhism items on at Tokonoma of their house (See also The history of Butsudan #2). Then Butsudan got a turning point. Rennyo of Jodo Shinshu school appeared. Rennyo was Jodo Shinshu Hongwanji-temple the 8th, he is the important person in Jodo Shinshu history. Rennyo had propagated Jodo Shinshu’s teachings actively, and he had recommended doing a religious service to followers everyday. For that reason, he had issued many “Rokuji Myogo (Namu Amida Butsu)”. According to records, Rennyo didn’t mention Butsudan. Followers who were given Rokuji Myogo from him had gotten habit of putting it into box-like cabinet. That is the first case of Butsudan. In Edo period (17th ?19th century), Edo Bakufu shogunate had enacted Danka System. (see also Wikipedia). The purpose of this system was to make Christianity into prohibited religion. For that reason, common people had got a necessity to belong to Buddhism temple (to avoid to become offender). Further, the lay people line of Jodo Shinshu had high affinity to Edo Shogunate’s religion policy. For that reason, other Buddhism schools also had adopted Butsudan in imitation of Jodo Shinshu. 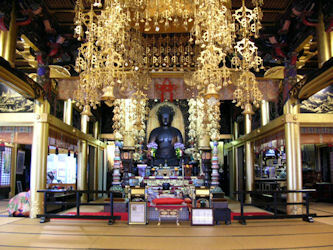 Japanese Buddhism had experienced this history, and Japanese Buddhists got a habit of having Butsudan (at family unit). Nowadays, Bustudan have various styles. In Heian period (8th ? 12th century), Japanese Imperial culture reached its peak during period. At the same time, Mappou Shisou (one of eschatology) prevailed in the years. Noble clung to Buddhism, they built temples (Jibutsudo). The representative Jibutsudo is Byodo-in Houou-do. Byodo-in may be compared to the large Butsudan. In the latter of Heian period, Hounen, Shinran, Dogen, Eisai and Nichiren are appeared, they put forward a new Buddhism (called Kamakura Buddhism). Buddhism changed from noble’s to common people’s. In Kamakura period (Samurai ruled Japan), many Samurai became a believer in Zen. For that reason, Zen culture had influenced Japanese culture strongly. The representative item, Ihai (spirit tablet). Kaimyo (Dharma name) is written on it by monk (after the death generally). However, the so-called Butsudan had never appeared. They put Buddhism items on at Tokonoma of Shoin-Zukuri (Zen cultural house). Maybe you can’t understand about Butsudan if you’re not Buddhist. No, even if you’re Buddhist, maybe you can’t understand about it unless you’re Japanese Buddhist. Because Butsudan is special Buddhism item of Japanese Buddhism culture. Generally, Butsudan consist of high-class timber, Urushi lacquer and metal. Any materials are expensive, and it’s produced sophisticated works by 7 – 8 craftsmen. So, it’s not cheap item. Instead of expensive, Butsudan would stay approximate 100 years. This is Butsudan (it’s super high-class version). There is also more than 130,000 USD. Butsudan and inner temple are made in imitation of Buddhism world, Mount Meru (Shumisen in Japanese). This is called Shumidan. About Mount Meru, please refer to Wikipedia. We have other similar items also, that’s called Butsugan and Zushi. It’s very difficult to define about Butsudan and them. Generally, Butsugan is space of dug wall (install statue at there). Zushi is the case of suitable for statue size. In Japan, Shozon-Butsugan that was brought by Kobo Daishi is very famous. Sometimes Zushi is not cheaper than statue itself. Because Zushi have high-class timber, Urushi lacquer and metal. Therefore, Butsudan is advanced Zushi. And it’s like a miniature temple (The origin of Butsudan is temple). The origin of Buddhism temple is considered the hill that put sacred item on after the death of Gautama Siddhartha in India. Buddhism was introduced to Japan from Baekje (Korea) in 6th century. At same time, Zushi also came. The famous Japanese Zushi is Tamamushi-no-Zushi in Horyu-ji temple at Nara. This Zushi is the oldest one in Japan. In 8th century, the 45th Emperor, Emperor Shomu gave Imperial order on establishment of Buddhism temple to whole country. The site is located at the cross of Shichijo st. and Takakura ave. You can see old-fashioned building. Shichijo Studio had been moved from here to Shijo-Karasuma during Muromachi period (14th – 16th century). So, this house is common house. Please don’t have behavior without thinking of anyone else. We can’t conclude that Jocho had lived there. According to the records, Kakujo who is son of Jocho had lived there. The explanation plate is saying that Jocho is the father of Buddhism statue craftsman. However Kojo (teacher of Jocho) is called the father of craftsman among the experts. Even if Kei group had the golden age in Kamakura period, other group didn’t vanish completely. In the end of Kamakura period, Japan had got unstable, and the Imperial Court had been separated into two. The early 14th century, Japan had got stable again by Ashikaga Yoshimitsu, Muromachi Bakufu the 3rd Shogun. And In group joined hands with new administrators, calm statues came back again. From the latter of Muromachi period to Sengoku period (Warring states period, 15th -16th century), realistic statues came back again. We have to know remarkable article during this period. That is craftsman Shukuin. He appeared at Nara. He was a special in comparison with other craftsmen. He was a carpenter, not a monk (other craftsmen were one of a monk (had a holy orders)). He used Japanese cypress, and he didn’t color to statue (his works are all naked wooden statue). And he sold statues at own store (other craftsmen made statues to order). The name Shukuin was hereditary name, we found three persons had used this name for 80 years. Almost current craftsmen’s style resemble to Shukuin. I mean, almost current craftsmen are not a monk. And their works are almost naked wooden statues. After warring period, and Edo period had begun (17th ? 19th century), many statues and temples had been restored to its former condition by many craftsmen from coast to coast. Sometimes awful statue can be found, because hastily acquired craftsmen were increased. On the other hand, unique and pretty statues also appeared by Enku and Mokujiki (they were a monk). Current Japanese people have tendency to love naked wooden statues because we have a lot of chance to watch faded statues. However, I see colorful statues at old house. I guess people of Edo period has saw restored statues. In 1868, Japan have become modernized nation. It’s Meiji period. Meiji government adopted the principle of separation of government and religion, so new age and new wave approached to Buddhism statues (example for Buddhism statue with western methods, just a fine art statue with unbelieving and so on…). We can see various statues. Perhaps the present is reform times.